Abarth, Alfa Romeo, Audi, Chrysler, Dodge, Fiat, Jeep, Mazda and Ram have all been added to the list of partners, which now totals 29. Ferrari, Honda, Hyundai, Mercedes-Benz and Volvo will have CarPlay available for certain vehicles by the end of 2014. The rest of the partners have more vaguely committed to CarPlay for “future models.” Audi recently clarified that it will bring CarPlay-equipped models to Europe in 2015 and the states in 2016. Using voice commands and a large touchscreen, CarPlay allows you to interact with apps like Music, Maps, Messages and Mail in an interface designed to keep your eyes on the road. Automakers like Mercedes-Benz and Ferrari have already shown off CarPlay in their newest vehicles. 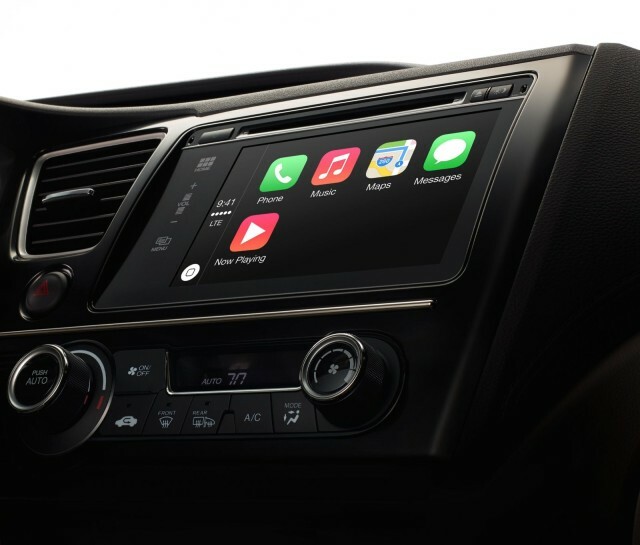 CarPlay is also planned for aftermarket systems from companies like Pioneer and Alpine. Pioneer has said that CarPlay will be available via a firmware update for five of its in-dash receivers by “early summer” 2014. Alpine’s CarPlay-compatible system will be available later this year. The iPhone 5 and above can connect to CarPlay via Bluetooth LE. As part of the Open Automotive Alliance, Google has 40 partners on board to support Android Auto, as well as aftermarket players like Pioneer. Many of those 40 partners will also offer CarPlay, like Volvo and Hyundai.